Could there be trouble in paradise for Harley Quinn and the Joker? A new Birds of Prey leaked set photo seems to imply that the iconic couple is no longer an item. DC fans got a huge news announcement earlier this week when it was revealed that Margot Robbie was back as Quinn and on the set, officially filming the upcoming movie. Additionally, it was announced that Ben Affleck is no longer Batman and that James Gunn is making some big changes with Suicide Squad 2. A leaked set photo from Birds of Prey shows Margot Robbie's Harley Quinn walking down the street with some foil in her hands. It's unclear what's in that foil, but Quinn has a huge smile on her face as she peers at the object. It's a pretty standard leaked set photo without any context, but closer inspection reveals something else entirely. When the picture is zoomed in, we can see some of Quinn's tattoos on her thighs and one of them reads: "Harley + Puddin," with the "Puddin" crossed out. 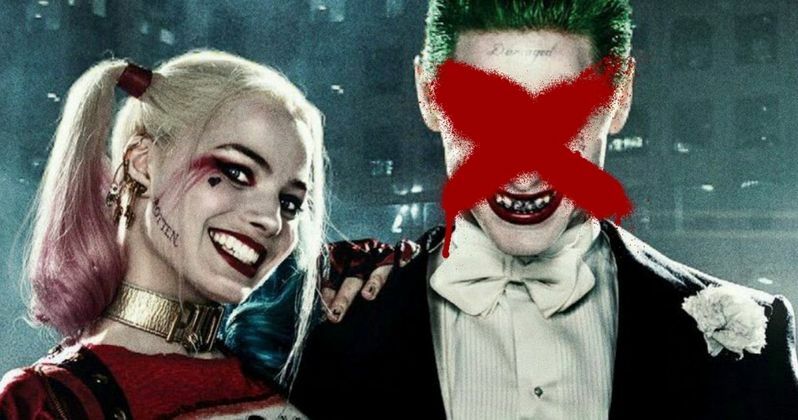 This certainly suggests that Harley Quinn and the Joker will not be together in Birds of Prey. Jared Leto has not been cast in the movie and there have not been any reports about the Joker showing up in the project. Plus, it's believed that Leto will be filming on Sony and Marvel's Morbius the Living Vampire in the coming weeks. When you're dealing with such a volatile couple, there is bound to be some ups and downs in the relationship. While Joker doesn't look like he's going to show up in Birds of Prey, it also looks like he and Harley Quinn may be sitting out on Suicide Squad 2. This has yet to be confirmed, but James Gunn is reportedly working on something fresh for the sequel after getting the boot from Disney. As for the Joker and Harley Quinn movie, a script is finished and is supposedly "crazy," which makes sense. However, it is unclear if that project is going to move forward or not at this time. Birds of Prey has hit the ground running since production started earlier this week. In order to beat the leakers, DC Films and Warner Bros. released a Birds of Prey teaser video showing off the cast in character. This same strategy was used by Todd Philipps when he began shooting the Joker movie with Joaquin Phoenix and before that with Wonder Woman 1984 when director Patty Jenkins and star Gal Gadot released set photos from the very first day. Not only is it a wise decision from a production standpoint, it is also good for promotion. Fans love to see their favorite actors and actresses posting behind-the-scenes pictures and videos. With that being said, you can check out a new leaked photo from Birds of Prey below, thanks to the Oracle Twitter account.